Pets are family members too, and at Fence Factory we embrace all of their loveable, furry glory. We manufacture product lines of agricultural fences and dog runs to ensure our four-legged friends are getting all of the safety and security they deserve. In keeping with this spirit, we partnered with local dog adoption agencies and kicked off a summer pet adoption series on June 15 in Goleta. We were able to partner several loving families with lucky dogs who were doomed for a life in a shelter – or worse. It was pretty rewarding to witness the “dancing dog,” the child find the pup just for him, and the newlyweds bring home their first “baby.” It was confirmed that we knew we were doing a good thing – not just saving lives, but making them complete. If you missed the Goleta event don’t worry! There are two more opportunities quickly approaching: June 29 in Ventura and a to-be-determined date in Agoura Hills. 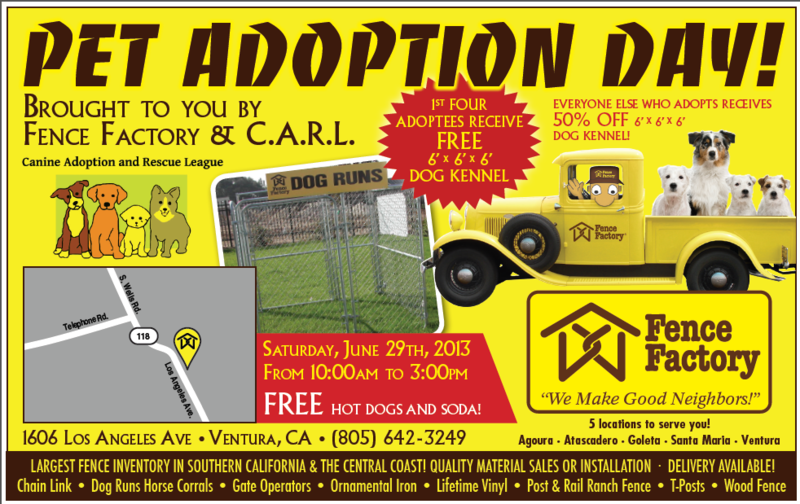 We will be offering special discounts on dog runs, and even giving one away! We invite you to come out and join us in supporting this great cause. After all, that pup just for you is waiting to be saved and taken to his “furever” home.